You can watch this and other animes on Crunchyroll. The Chapter starts where the past one left off. With the public going crazy and violent and Fuuka´s band about to show up in the scenery, the things looks grim for Yuu´s Sisters, “Tama-Chan” and even the hedgehogs members; for Koyuki… She truly doesn´t know what to do to repair the damage she has done. Still the band comes out and prepares their instruments! The band is ready to rock and roll; but suddenly a bottle lands in Yuu´s bass damaging it beyond repair; at the same time a shard of glass cut Yuu´s Forehead and blood starts going out from that wound. A second bottle was about to be thrown; but one of Yuu´s Sisters gets in the way and slaps that person! Still her defense is meaningless and she got grabbed by the person with the bottle, now they want that his whole family to apologize or else! Suddenly “Tama-Chan” decides to reveal herself in order to stop all of this, saying that if they want an apology she will give them! The people went crazy by being near a celebrity! They start pushing and, for a lack of a better word, they are sandwiching her, hurting her and making her feel uncomfortable. The teacher wants them to stop or she will call the police; but her words gives no results. At the same time someone is streaming all this mess on the web. Meanwhile at Koyuki´s recording studio, someone has noticed such stream and calls for her Manager, who gives the order to investigate what School is this one since they are going to shut it all down! Back at the School… The lights went off. No one is able to see anything, everything was darkness. Suddenly the lights on the stage turns on and Fuuka alongside her band mates are in there, Yuu has a new bass, the one used by the real Nico from the hedgehogs, it seems that Yassan brought some instruments. “Tama-Chan” could see the voice of her Rival and how a good singer Fuuka is. The song ends and the public went crazy! Not with violent intentions; but for admiration towards Fuuka and her band! 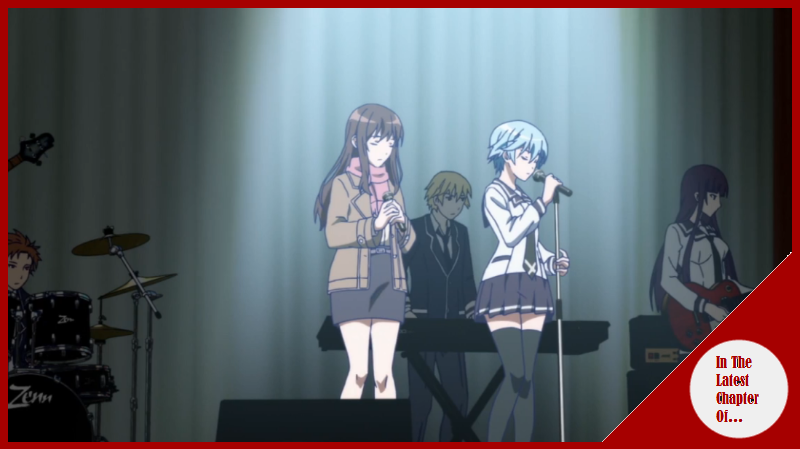 Fuuka approaches to the edge of the stage and invites Koyuki to come up and sing with them. Koyuki was awaiting for an angry response and lots of criticism; but she was received with compassion and understanding, everyone was rooting for her love to come true even one day, that she did nothing wrong, she is just a Maiden in love and wanted to tell the guy she loves how she feels. After that, Fuuka´s Band is in a family restaurant celebrating that their first concert was a success! Yuu was remembering that after the concert Koyuki went up to a car with her Manager and went away. Then Yuu ask Fuuka what was she talking about with someone after the concert? Fuuka responds saying that she got asked what was the Band´s name. Then… The Band starts deciding what would be their name. Mikasa then decides to use th name of one of their members… In the case of Fuuka Akitsuki in English it was “Fall Moon”. Then Sara added that “Fallen Moon” would be correct grammatically. Fuuka didn´t wanted that name at first; but after telling her that they became a band thanks to her… She reluctantly accepted it. A little later, Nachi tells them that the Concert has been uploaded to the web and it has a lot of views; maybe thanks to Koyuki´s participation. In any case The Fallen Moon is concerned since they don´t know what kind of problem she might get because all of this. Meanwhile with Koyuki, her Manager has come back and well… She got scolded by the president. In any case now that all of this has passed; they can focus on work! Also the Manager has only one petition to Koyuki…That for the time being… She must not contact with that Yuu Haruna guy. The disappointment can be see in “Tama-Chan”´s eyes, her Manager told her that it was for her sake since right now they don´t want another incident and even a treath where Koyuki might get hurt or something worse… SO she has to listen. In the upcoming days, “Nico-Kun” tried to get in contact with “Tama-Chan” to no avail… The calls weren´t taken and the message were left unanswered. In the School, Sara shows to Yuu the news regarding Koyuki Hinashi… That her concerts and public appearances have started to be cancelled one after the other; the press believes this has to do with the Photography incident. The day for the essay comes and Koyuki is prepared to do her best… The music starts sounding and… Her voice can´t come out; for some reason when she tries to sing her voice stops at her throat and won´t come out. At the Hospital the Doctor told her that this was just for stress so she just needs to rest and she will be fine; Her Manager then ahs decided that… Sadly her Christmas concert will get cancelled, the things haven´t been to good to “Tama-Chan” as of recently. To disappoint her fans, to not be able to talk with her loved one, All of these things are a big burden in Koyuki´s shoulders, a burden that even her Manager can´t get to grasp and understands. …She has entered in Hiatus and has cancelled all of her concerts; this is due to her health. Quickly Yuu grabs the phone and calls her again. Surprisingly, “Tama-Chan” picks up and she just says in a very sad manner that she is Ok, that he must no need to worry about herself….After that she cuts off the call. Without thinking it twice and even if he doesn´t know where “Tama-Chan” is, “Nico-Kun” grabbed his jacket and went on her search! Something inside him is telling him that she is not Ok, that she needs him! He goes to the closest metro station and looks how it has started snowing. The memories comes as fast as a lightning and he starts remembering his time with “Tama-Chan” and how when they where children, he couldn´t do anything for her in her time of need; but now, and with God as his witness, he won´t get to repeat that story! He will help her! He won´t back down on her! At the same beach, now dressed in white thanks to the snow, where “Nico-Kun” and “Tama-Chan” lighted the fireworks; Yuu has found Koyuki, the bassist of The Fallen Moon is out of breath; but he is happy that has found that dear person for him. Koyuki ask him why is he in here? Yuu responds with the little breath he has that he was worried sick about her since She doesn´t take his calls and now there it is the news that she is on hiatus and…and everything! <<<Sorry… Nico-Kun… I´m Sorry for loving you>>> says Koyuki to Yuu while tears comes out of her eyes and her face gets wet. … his arms embrace her while the snow fell in that cold day, the eyes of Koyuki where wide open. “Say Whaaaat?! Fuuka has gone full fanfic? !” Those where my words after watching the chapter, since after the extraordinarily amazing first half, we got…Well A very interesting and different scenario. I´m not criticizing it as something bad, mind you; but it is truly different than how in the manga the things happened. I mean, man I truly don´t know what will happen! And in a way that is extremely exciting! Now going a little slower, I truly liked the first half of the chapter; with a good balance between the actions and the musical part was extremely good. I truly liked how the things went out and how everything was made, also the new elements (like the streaming part) truly gave a new perspective and something new, yet familiar about all of this. We also have the name of the band! The Fallen Moon, now I will spoil a little in what will happen in the future of the manga, and I will say that this band will face a lot of troubles and mountains to climb; but they will succeed in their endeavors until it´s sudden end due to a change in the band members. Now… On the second half… Man, I don´t even have words to describe what is happening right now… I mean, We have Koyuki with Stress and pain; Yuu who it seems he will choose for “Tama-Chan” instead of Fuuka, and… I mean, what? My mind still does not compute; it´s like seeing 2 different realities, 2 different branches in the storyline where the Manga went with 1 direction (…) while the other went to another one!